» Carbon dioxide response curve, dark respiration, specific leaf area, and leaf nitrogen data for the 2014 Eriophorum vaginatum reciprocal transplant gardens at Toolik Lake and Sagwon, AK, collected in 2016. 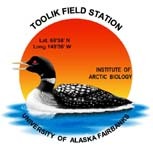 Transplant gardens at Toolik Lake and Sagwon were established in 2014. At each location, 60 tussocks each from ecotypes of Eriophorum vaginatum from Coldfoot (CF, 67°15′32″N, 150°10′12″W), Toolik Lake (TL, 68°37′44″N, 149°35′0″W), and Sagwon (SAG, 69°25′26″N, 148°42′49″W) were transplanted. Half the transplanted tussocks were grown under ambient conditions, while the other half were exposed to passive warming supplied by open-top chambers (OTC). Data were collected in late June through July 2016 include carbon dioxide response curve data, dark respiration, specific leaf area, and leaf nitrogen content. In late June and July 2016, five E. vaginatum tussocks per ecotype and treatment (ambient vs. OTC) combination were measured in each transplant garden. Measurements consisted of CO2 response curves (i.e., A/Ci curves) at leaf temperatures of 15, 20, and 25°C. Dark respiration was also measured at each measurement temperature. In late July 2016, one to two tillers per ecotype by treatment combination at each garden were clipped and used to determine specific leaf area. After drying, leaf samples were ground into a fine powder and submitted to the Washington State University Stable Isotope Core Laboratory for percent nitrogen determination via elemental analysis.